You’re looking at mortadella, warm fried eggplant, a hearty later of melted and thinly sliced sharp provolone, peppery arugula, and balsamic vinaigrette on ciabatta. All freshly sliced and prepared to order. The chicken parmesan hero is also solid and I’m always tempted to try one of their other two dozen sandwich creations, or the daily special, or a bowl of pasta, or just sit down and eat a meat plate, nicely arranged on a wooden cutting board, sipping a macchiato and wallowing away the day in a sea of salty, porky goodness. Every neighborhood in New York City should have a place like Sergimmo Salumeria. 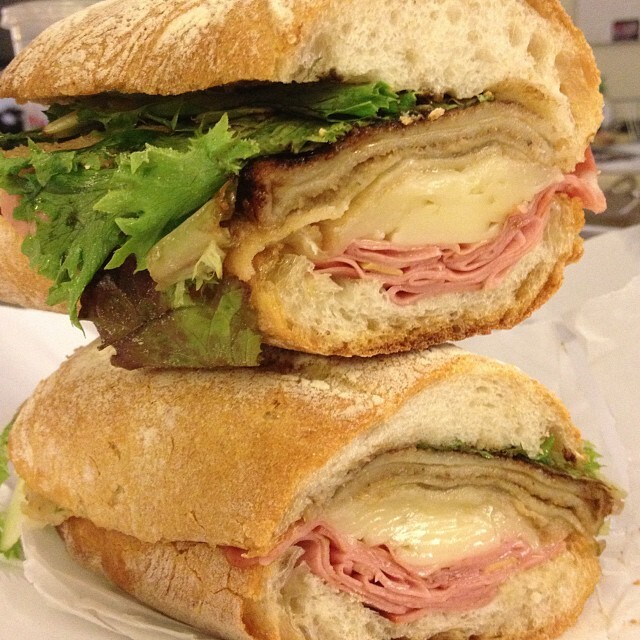 Honorable mention for 2nd best Italian sandwiches in Midtown West goes to Salumeria Biellese on the corner of 29th street and 8th Ave. They cure their own meats, including what I consider the best soppressata (spicy salami) in the city, and that gives them some serious cred, but they lost points because as Serious Eats says, you’re better off bringing your own bread than eating theirs and that’s just not gonna cut it for on-the-go New Yorkers. Great bread and some excellent sandwiches. Nice alternative for a pre-Ranger game meal.